If you had told me 10 years ago that I would be a small business owner and a competitive powerlifter, I would have thought you were crazy. But, here I am (and it still kinda surprises me every day). I know that a big reason I’ve been able to get here is because of the amazing coaches supporting me in achieving my goals. After almost twenty years of being a coach in schools all over the world, and ten years of consulting with schools about innovative learning practices, I feel like I’ve learned so much about coaching – and being coached. But it’s in these last two years of really stretching myself, both mentally and physically, that I’ve truly recognized the power of having a coach in my corner. You see, the interesting thing about being a coach is that you’re often perceived as an expert, and sometimes we fall into the trap of feeling like, as an expert, we know enough to solve our own challenges. But actually, a big part of being a successful coach is realizing the value of having your own coach. Everyone needs a coach, even the coaches! So many times when I’m struggling with something that’s an area of growth for me, I simply can not see my way out of it. I get all wrapped up in my own head, and can only see with one perspective. But when I support a colleague, I can see so many other perspectives, strategies and potential solutions so quickly and easily. As Adrienne and I were talking, I realized how many times it was easy for me to see a path forward or recognize a misstep when I was supporting another colleague. If only I had someone who was supporting me in my professional goals with that kind of clarity. And, what if that person was so dedicated and focused on my goals, and making sure I was equipped to reach them, that I felt like I could come to them with anything and be supported? Oh, the irony, because, of course, that’s what a coach does for their teachers. So, who coaches the coaches? Who supports them in taking the next step in their learning journey? Who helps them identify strengths and opportunities for growth? Who helps them prioritize, strategize and make the most effective and practical use of their very busy days? We often say that teachers should be learners too, and that doesn’t end when we become coaches. wishes they had a coach too. would love to have an experienced coach by their side to talk them through specific challenges they’re facing in their role in schools. would love to see good coaching modeled on a regular basis. And I’m sure I’m not the only coach who wants to #coachbetter in 2019. That’s why I’m so excited about our third cohort of our EduroLearning The Coach Microcredential. The core component of our program is having your own private mentor (spoiler alert, it’s me or Diana!) for the entire academic year. In addition to providing all of our best online courses designed specifically for instructional coaches in schools in one streamlined program, The Coach includes your own private mentor to guide you through all of the course content, to help you set a specific professional goal for the program, and then support you in reaching that goal. It has been such a privilege to mentor our previous participants and graduates, to see how much they’ve grown and accomplished over the course of the program, and I can’t wait to start working with our next cohort of dedicated coaches! It’s common for parents to be concerned about their child’s online safety. You’ll likely get a variety of questions about how you will keep your students safe online. Take this time to explain all of the critical digital citizenship skills you are including as you use technology for learning. Help parents understand that this kind of learning experience builds safe, responsible and respectful online habits and behavior that can be applied in a school setting (where there might already be filters or blocked websites in place) AND outside of school (like a friends house or a coffee shop, where there might not be any filters at all). What are people saying about The Coach Microcredential Program? Dalton is a participant in our second cohort of The Coach Microcredential. Here’s what he had to say when asked about his experiences in our academic-year-long mentorship program. To give you a preview of what you’ll learn, we have tons of great content coming out every single week! Our YouTube channel is full of relevant and practical coaching content – we have two new videos every week! 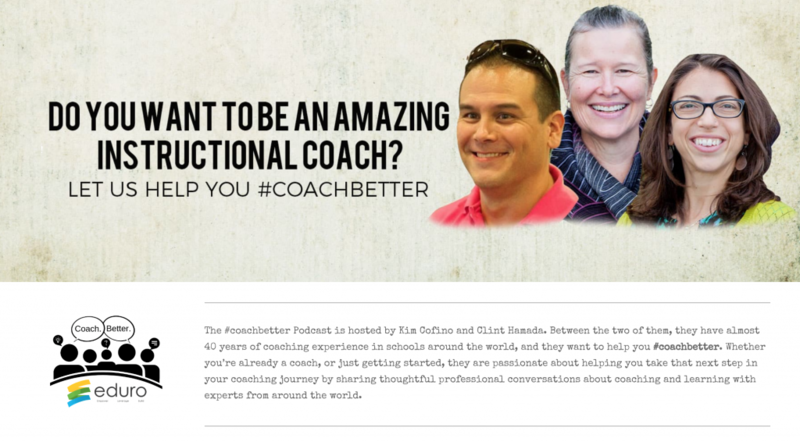 Every Wednesday we share a #coachbetter video episode where Clint and I chat with other inspiring educators from around the world. Currently, these episodes are quite long (around an hour), but we’re going to switch things up in May so that each episode on YouTube is a spotlight of a longer audio conversation (that you can find on your favorite podcast player). Spotlights will feature a great moment from the longer podcast that week. After each episode airs, three of our amazing The Coach participants (Nick, Jana, and Verena) facilitate a Twitter slowchat based on the podcast episode, so you can connect with other coaches who are listening and learning too! Every Friday Chrissy and I are sharing a 5 Minute Friday tip, strategy or idea to help you #coachbetter! These are based on questions we’ve been asked in our Eduro Learning #coachbetter Facebook group, or on our Instagram or Twitter accounts. If you have a question you would like to see answered, let us know! If you prefer to listen, rather than watch, our #coachbetter episodes are also available wherever you get your podcasts. Bonus, we keep really detailed show notes on our podcast site too! Do you have a coach in your corner? Do you have your own coaching story? How has having a coach helped you in your professional growth? What was the value of having a coach for you? I would love to hear your experience too! Are you on our Coach Mailing List? Subscribe to our Coach Newsletter to receive coaching tips, curated resources specific to instructional coaching plus videos just for coaches delivered straight to your inbox. Be the first to know about promotions, special offers, and #coachbetter news! We despise spam and we respect your privacy. We will not share or sell your personal information.